Protein Blend (Beef Protein Isolate, Salmon Protein, Chicken Protein, Egg Albumin, Brown Rice Protein, Pea Protein), Gluten-Free Rolled Oats, Carbohydrate Blend (Dehydrated Yam, Dehydrated Sweet Potato, Pea Starch, Coconut Water Powder, Dehydrated Blueberries, Dehydrated Goji Berries, Maltodextrin, Dextrose, MCT Oil, Cellulose Gum, Cinnamon, Salt, Sucralose, Acesulfame-potassium), Soy Protein Isolate, Vegetable Pils (Palm, Palm Kernel, Soybean), Sugar, Vegetable Glycerin, Sorbitol, Water, Maltitol, Whey Protein (fron coating), Peanuts, Brown Rice Flour, Chicory Root Fiber, Natural Flavors, Sunflower Lecithin, Corn Flour, Whey, Mono and Diglycerides, Soy Lecithin, Beta-Carotene, Vitamin A Palmitate, Sucralose, Potassium Sorbate, Corn Starch, Fruit and Vegetable Extracts and Almond, and Sucralose. Contains Milk, Soy, Almond, Peanut, Egg, Coconut and Fish. Manufactured in a plant that processes milk, soy, wheat, treenut, peanut, egg and fish. Protein Blend (Beef Protein Isolate, Salmon Protein, Chicken Protein, Egg Albumin, Brown Rice Protein, Pea Protein), Gluten-Free Rolled Oats, Carbohydrate Blend (Dehydrated Yam, Dehydrated Sweet Potato, Pea Starch, Coconut Water Powder, Dehydrated Blueberries, Dehydrated Goji Berries, Maltodextrin, Dextrose, MCT Oil, Cellulose Gum, Cinnamon, Salt, Sucralose, Acesulfame-potassium), Soy Protein Isolate, Vegetable Pils (Palm, Palm Kernel, Soybean), Sugar, Vegetable Glycerin, Sorbitol, Water, Maltitol, Whey Protein (fron coating), Peanuts, Brown Rice Flour, Chicory Root Fiber, Natural Flavors, Sunflower Lecithin, Corn Flour, Whey, Mono and Diglycerides, Soy Lecithin, Beta-Carotene, Vitamin A Palmitate, Sucralose, Potassium Sorbate, Corn Starch, Fruit and Vegetable Extracts and Almond. Protein Blend (Beef Protein Isolate, Salmon Protein, Chicken Protein, Egg Albumin, Brown Rice Protein, Pea Protein), Gluten-Free Rolled Oats, Carbohydrate Blend (Dehydrated Yam, Dehydrated Sweet Potato, Pea Starch, Coconut Water Powder, Dehydrated Blueberries, Dehydrated Goji Berries, Maltodextrin, Dextrose, MCT Oil, Cellulose Gum, Cinnamon, Salt, Sucralose, Acesulfame-potassium), Soy Protein Isolate, Vegetable Pils (Palm, Palm Kernel, Soybean), Sugar, Vegetable Glycerin, Peanuts, Sorbitol, Water, Maltitol, Whey Protein (from coating), Maltitol, Brown Rice Flour, Chicory Root Fiber, Cocoa, Natural Flavors, Reduced Mineral Whey Powder, Sunflower Lecithin, Whey, Mono and Diglycerides, Soy Lecithin, Beta-Carotene, Vitamin A Palmitate, Potassium Sorbate, Almond and Sucralose. Protein Blend (Beef Protein Isolate, Salmon Protein, Chicken Protein, Egg Albumin, Brown Rice Protein, Pea Protein), Gluten-Free Rolled Oats, Carbohydrate Blend (Dehydrated Yam, Dehydrated Sweet Potato, Pea Starch, Coconut Water Powder, Dehydrated Blueberries, Dehydrated Goji Berries, Maltodextrin, Dextrose, MCT Oil, Cellulose Gum, Cinnamon, Salt, Sucralose, Acesulfame-potassium), Soy Protein Isolate, Vegetable Oils (Palm, Palm Kernel, Soybean), Sugar, Vegetable Glycerin, Sorbitol, Water, Maltitol, Whey Protein (fron coating), Peanuts, Brown Rice Flour, Chicory Root Fiber, Natural Flavors, Sunflower Lecithin, Corn Flour, Whey, Mono and Diglycerides, Soy Lecithin, Beta-Carotene, Vitamin A Palmitate, Sucralose, Potassium Sorbate, Corn Starch, Fruit and Vegetable Extracts and Almond. Protein Blend (Beef Protein Isolate, Salmon Protein, Chicken Protein, Egg Albumin, Brown Rice Protein, Pea Protein), Gluten-Free Rolled Oats, Carbohydrate Blend (Dehydrated Yam, Dehydrated Sweet Potato, Pea Starch, Coconut Water Powder, Dehydrated Blueberries, Dehydrated Goji Berries, Maltodextrin, Dextrose, MCT Oil, Cellulose Gum, Cinnamon, Salt, Sucralose, Acesulfame-Potassium), Soy Protein Isolate, Vegetable Oils (Palm, Palm Kernel, Soybean), Sugar, Vegetable Glycerin, Sorbitol, Maltitol, Whey Protein (from coating), Water, Peanuts, Brown Rice Flour, Chicory Root Fiber, Natural Flavors, Sunflower Lecithin, Whey, Mono and Diglycerides, Soy Lecithin, Beta-Carotene, Vitamin A Palmitate, Natural Colors, Potassium Sorbate, Almond, and Sucralose. Contains Milk, Soy, Almond, Peanut, Egg, Coconut and Salmon. Manufactured in a plant that processes Milk, Soy, Wheat, Treenut, Peanut, Egg and Fish. Protein Blend (Beef Protein Isolate, Salmon Protein, Chicken Protein, Egg Albumin, Brown Rice Protein, Pea Protein), Gluten Free Rolled Oats, Carbohydrate Blend (Dehydrated Yam, Dehydrated Sweet Potato, Pea Starch, Coconut Water Powder, Dehydrated Blueberries, Dehydrated Goji Berries, Maltodextrin, Dextrose, MCT Oil, Cellulose Gum, Cinnamon, Salt, Sucralose, Acesulfame-Potassium), Soy Protein Isolate, Vegetable Oils (Palm, Palm Kernel, Soybean), Sugar, Vegetable Glycerin, Sorbitol, Water, Maltitol, Whey Protein (from coating), Peanuts, Brown Rice Flour, Chicory Root Fiber, Natural Flavors, Sunflower Lecithin, Corn Flour, Whey, Mono and Diglycerides, Soy Lecithin, Beta-Carotene, Vitamin A Palmitate, Sucralose, Potassium Sorbate, Corn Starch, Fruit and Vegetable Extract, and Almond. Protein Blend (Beef Protein Isolate, Salmon Protein, Chicken Protein, Egg Albumin, Brown Rice Protein, Pea Protein), Gluten-Free Rolled Oats, Carbohydrate Blend (Dehydrated Yam, Dehydrated Sweet Potato, Pea Starch, Coconut Water Powder, Dehydrated Blueberries, Dehydrated Goji Berries, Maltodextrin, Dextrose, MCT Oil, Cellulose Gum, Cinnamon, Salt, Sucralose, Acesulfame-Potassium), Soy Protein Isolate, Vegetable Oils (Palm, Palm Kernel, Soybean), Sugar, Vegetable Glycerin, Peanuts, Sorbitol, Water, Whey Protein (from coating), Maltitol, Brown Rice Flour, Chicory Root Fiber, Cocoa, Natural Flavors, Reduced Mineral Whey Powder, Sunflower Lecithin, Whey, Mono and Diglycerides, Soy Lecithin, Beta-Carotene, Vitamin A Palmitate, Potassium Sorbate, Almond, and Sucralose. Contains Milk, Soy, Almond, Peanut, Egg, Coconut and Salmon. Manufactured in a plant that processes Milk, Soy, Wheat, Treenut, Peanut, Egg and Fish (Salmon). Protein Blend (Beef Protein Isolate, Salmon Protein, Chicken Protein, Egg Albumin, Brown Rice Protein, Pea Protein), Gluten-Free Rolled Oats, Carbohydrate Blend (Dehydrated Yam, Dehydrated Sweet Potato, Pea Starch, Coconut Water Powder, Dehydrated Blueberries, Dehydrated Goji Berries, Maltodextrin, Dextrose, MCT Oil, Cellulose Gum, Cinnamon, Salt, Sucralose, Acesulfame-Potassium), Soy Protein Isolate, Vegetable Oils (Palm, Palm Kernel, Soybean), Maltitol, Vegetable Glycerin, Whey Protein (from coating), Peanuts, Sorbitol, Almonds, Maltitol, Water, Brown Rice Flour, Chicory Root Fiber, Natural Flavors, Corn Cereal, Corn Syrup, Corn Starch, Sunflower Lecithin, Whey, Mono and Diglycerides, Soy Lecithin, Beta-Carotene, Vitamin A Palmitate, Potassium Sorbate, Sucralose, Paprika Extract, and Caramel Color. Protein Blend (Beef Protein Isolate, Salmon Protein, Chicken Protein, Egg Albumin, Brown Rice Protein, Pea Protein), Gluten-Free Rolled Oats, Carbohydrate Blend (Dehydrated Yam, Dehydrated Sweet Potato, Pea Starch, Coconut Water Powder, Dehydrated Blueberries, Dehydrated Goji Berries, Maltodextrin, Dextrose, MCT Oil, Cellulose Gum, Cinnamon, Salt, Sucralose, Acesulfame-Potassium), Soy Protein Isolate, Vegetable Oils (Palm, Palm Kernel, Soybean), Vegetable Glycerin, Sugar, Sorbitol, Water, Maltitol, Whey Protein (from coating), Cocoa (Processed With Alkali), Peanuts, Brown Rice Flour, Chicory Root Fiber, Natural Flavors, Sunflower Lecithin, Whey, Mono and Diglycerides, Soy Lecithin, Beta-Carotene, Vitamin A Palmitate, Natural Colors, Potassium Sorbate, Almond, and Sucralose. Protein Blend (Beef Protein Isolate, Salmon Protein, Chicken Protein, Vitamin A Palmitate, Egg Albumin, Brown Rice Protein, Pea Protein), Gluten-Free Rolled Oats, Carbohydrate Blend (Dehydrated Yam, Dehydrated Sweet Potato, Pea Starch, Coconut Water Powder, Dehydrated Blueberries, Dehydrated Goji Berries, Maltodextrin, Dextrose, MCT Oil, Cellulose Gum, Cinnamon, Salt, Sucralose, Acesulfame-Potassium), Soy Protein Isolate, Vegetable Oils (Palm, Palm Kernel, Soybean), Sugar, Vegetable Glycerin, Whey Protein (from coating), Sorbitol, Peanuts, Maltitol, Water, Brown Rice Flour, Natural Flavors, Chicory Root Fiber, Corn Cereal, Corn Syrup, Corn Starch, Sunflower Lecithin, Whey, Mono and Diglycerides, Soy Lecithin, Natural Colors, Beta-Carotene, Vitamin A Palmitate, Potassium Sorbate, Almond, and Sucralose. Marc Lobliner of MTS Nutrition released the Outright Bar in two initial flavors. These whole food bars use REAL ingredients and natural flavor! Redcon1 is launching a CARROT CAKE flavor of its dairy-free protein bar, MRE Bar. This takes the lineup to a whole new level!! Redcon1 has revealed its next two flavors of MRE Bars! RedCon1 fans will be drooling with the addition of Sprinkled Donut & Crunchy Peanut Butter Cup! They're here, they use real food sources, and they're absolutely delicious!! 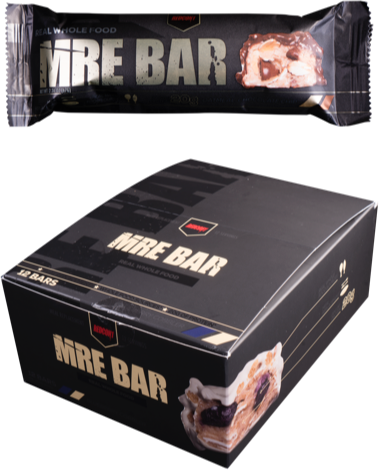 Read everything you need to know (and more) on our RedCon1 MRE Bar blog post!